The film's shooting script has a very distinct cover. Suicide Squad director David Ayer's at it again. Back in March he teased Arkham Asylum in a tweet, with Amanda Waller's line "I put 'em in a hole and threw away the hole" from the trailer further hinting we'll see the infamous prison in the film. Now Ayer wants to tickle your anticipatory glands a little more with another Arkham-centric tweet. Ayer's latest Arkham tidbit might be the coolest clue yet. The director took to the social media site and uploaded the following image. https://twitter.com/DavidAyerMovies/status/633340310811209729 The picture shows the movie's shooting script, bound in a cover bearing the Arkham logo. 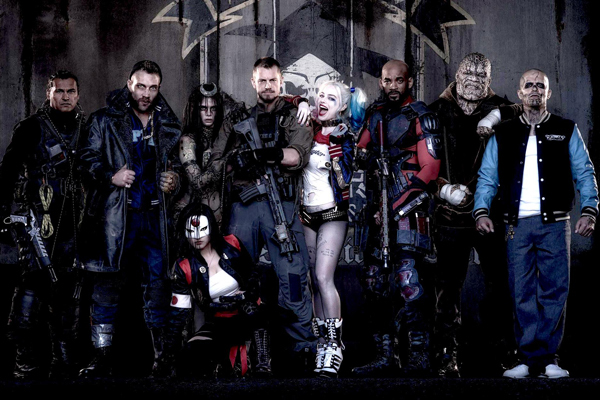 Aside from looking incredibly groovy, it further positions Arkham as central to Suicide Squad. The trailer shows various cells, including Harley Quinn's eerily singular prison, but doesn't specifically denote them as belonging to Arkham. With Ayer continually pushing the Arkham angle, it's starting to look likely some of those moments unfold at the facility. More excitingly, situating some action at Arkham also opens up the possibility for universe-expanding cameos. We know Suicide Squad unfolds in a post-Man of Steel world (Superman is name-checked in the trailer), which subsequently means it occurs in a world where Batman has been active for some time (remember, Affleck's incarnation of the character is seasoned). Which other villains might Batman have dumped their over his storied career? Maybe there'll be brief run-outs for The Riddler, The Penguin or Killer Croc (a man can dream)? Suicide Squad is an early and important entry into DC's proposed saga, and Arkham might be an economic way to introduce a whole lotta up-coming bad guys. Hopefully this isn't just foreplay from Ayer, and the establishment will feature prominently when Suicide Squad opens 5th August 2016. On a side note, if Arkham yields one surprise cameo, who'd you like to see? I'm sticking with Killer Croc (sorry). Writer, cinephile and owner of Vampire's Kiss on DVD. Take from that what you will.